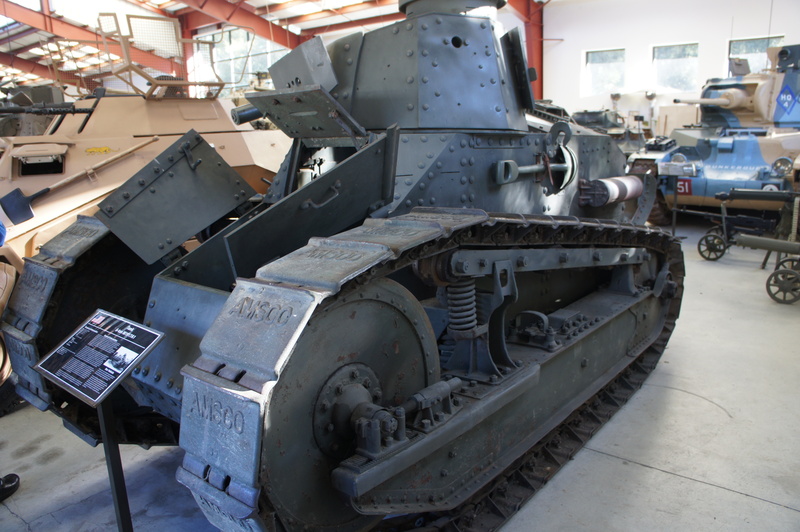 This past Saturday I visited the Military Vehicle Technology Foundation in Portola Valley, CA. It was once simply known as the Littlefield Collection, but with Mr. Littlefield’s passing it’s moved on to being a nonprofit organization. The collection of vehicles is simply stunning. Everything from captured Iraqi vehicles from Desert Storm, all the way back to pre-WWII tanks. The only thing I didn’t see displayed were any WWI tanks. Literally, there are hundreds of tanks on the property. This is the only working Panther tank in the world. Pulled out of a lake somewhere in Poland I believe, it was restored over the course of several years and only finished sometime after it’s benefactor’s passing in 2009. Cost of the restoration is given at 3 million bucks – which was apparently a good investment. If it was for sale, it’s worth in the neighborhood of 20 million dollars. Apparently the Panther suffered from a big design flaw – it started out its design life at several tons, with the drivetrain and engine developed with that assumption. As it progressed, the tank got too heavy. If the driver stomped on the gas, the gearing would break because of too much weight. Thus, it isn’t surprising to see this being the only one working in the world. 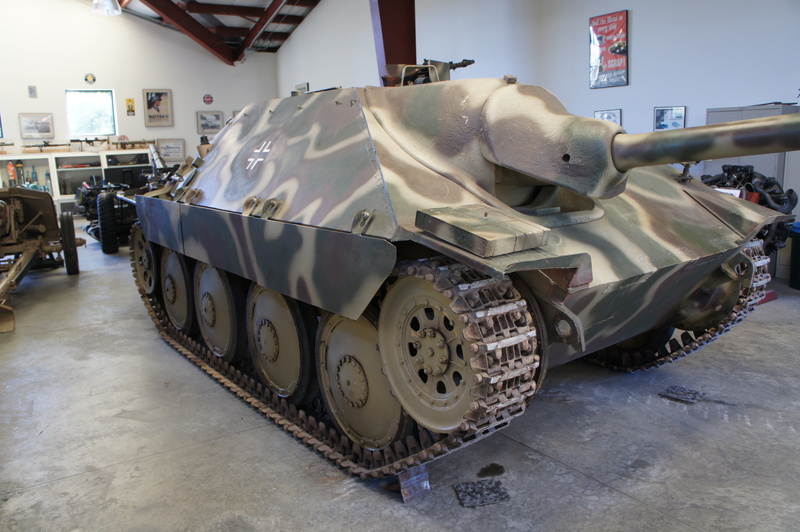 In person the Hetzer stands at perhaps 6’5″ and is a fearsome looking machine. The Stug III. Fearsome when seen in person. 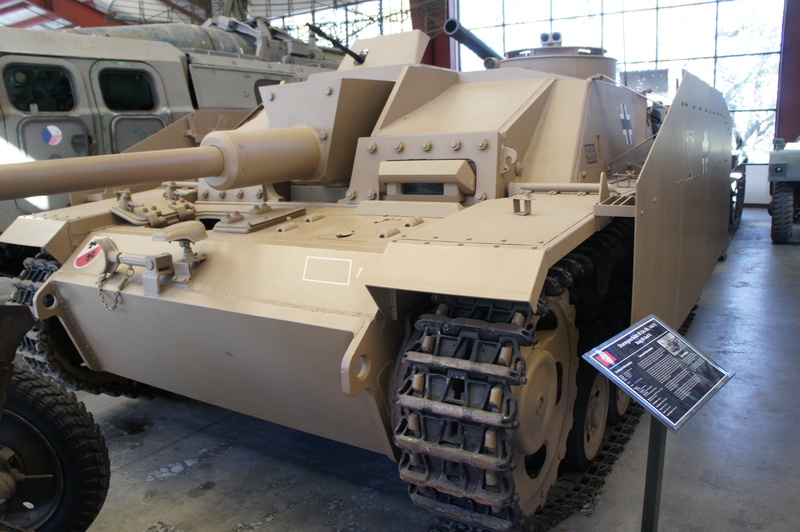 I was surprised at how….. lethal the Stug looks in person. It apparently accounted for a large number of tank kills for Germany during the war, and was cheaper to produce than a full Panther tank. This design got around. It’s clearly a MS-1 tank, and gave me the immediate impression “How on earth do TWO crew members get into this thing?” If I’ve got it all right, it’s a french design originally christened the FT-17 by the French. It made it to Russia where the design was copied and created as the MS-1. America also copied it and made a few christened the M1919A1. Notice those big rivets all over the thing – that had to be dangerous as rivets can pop out and probably kill crew under MG fire. The collection’s status is uncertain. 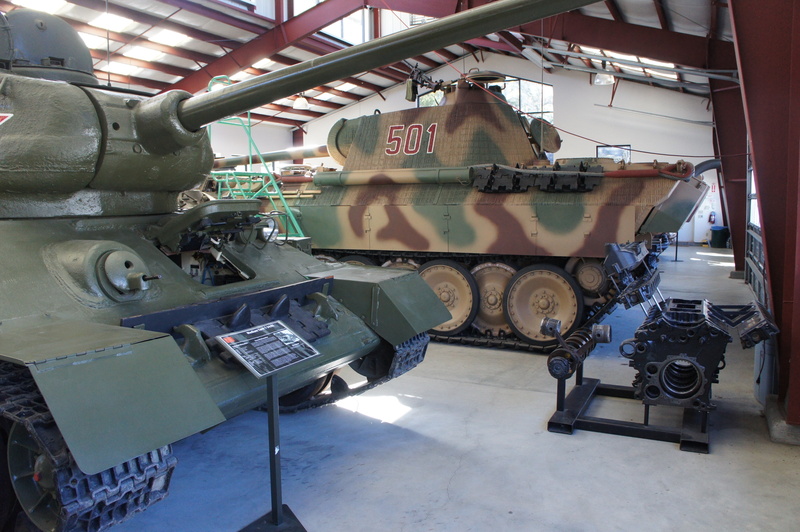 We were asked twice by our guide if we wanted to buy a slightly used T-54 once used in the movie “Tank Girl”. A mere $45,000. While it may or may not have been a bargain, I figured I’d have a hard time getting it into the garage and declined. It seems pretty clear that the collection needs some big organization to be donated to, such as a museum or a wealthy benefactor(s). I sure hope they find one. In the meantime, if I end up in the Bay Area again in the future you can guarantee I’ll go see it again. Our guide was a fantastically knowledgeable guy shooting out facts faster than a .50 caliber machine gun, all throughout our 2 1/2 hour tour. I took too many pictures and missed some of what he said, but that’s OK. I’d like to take family members for a second visit at some point. The last thing I wanted for this one, was to have one of the kids start being bored during the tour. And of course, what did they have in the gift shop ? Why, World of Tanks CD’s with bonus codes on them. I used the existing accounts code, but have a spare one for anyone wanting to create a brand new account. PM me if you’d like to create one and I’ll let you have it. If you get the chance – Go. Run. Do not walk, and see this collection. It’s a dead rich man’s collection and his heirs are less than thrilled at having the responsibility for it. I hope I get to see it again someday before….. whatever happens to it, happens.